John McCain (like John Kerry) was a congressional leader (and “a titan in the Senate”). Both have been successful politicians who have run unsuccessfully for president. Both men are Vietnam War veterans who (as a Republican and a Democrat) have done so much to support the painful process of normalization of relations between the two bitter enemies. John McCain (as a naval pilot) was shot down over a Hanoi lake during an air strike and jailed for over five years in the “Hanoi Hilton”, while John Kerry (as a gunboat officer) was wounded during battles in the Mekong delta during the Vietnam War. Both Johns are known much more for their peace- making efforts with Vietnam than for their war records. John McCain (unlike John Kerry) suffered so much in captivity, yet he worked so hard over the years (like John Kerry) to assist Vietnam’s post-war reconstruction and reconciliation. The last major action John McCain and John Kerry did for Vietnam was to lobby and support President Obama’s timely decision to lift the arms ban on Vietnam (May 23, 2016). John McCain fought for what he believed was right until the very end. In one of his last public acts, McCain blasted Trump’s summit with Putin (July 16, 2018) as “one of the most disgraceful performances by an American president in memory”. Then he went on “The damage inflicted by Trump’s naiveté, egotism, false equivalence, and sympathy for autocrats is difficult to calculate. But it is clear that the summit in Helsinki was a tragic mistake”. As John McCain died on August 25, 2018 (the full-moon thanksgiving day in Vietnam), he has left not only deep sorrow in the heart of his family and friends, but also a huge gap in the dynamics of US-Vietnam Relationship, at this critical juncture of history. There are few men who could really come to terms with their former enemy. And much fewer men are missed and loved by both friends and foes alike when they die. John McCain is such a man, as he stands larger than size with his uncommon values and valor. When John McCain was diagnosed with brain cancer (glioblastoma) a year ago, he told CNN “every life has to end one way or another”. He said: “I’ve lived very well and I’ve been deprived of all comforts. I’ve been as lonely as a person can be and I’ve enjoyed the company of heroes. I’ve suffered the deepest despair and experienced the highest exultation”. As John McCain died (at 81), Vice President Joe Biden said: “John McCain will cast a long shadow. His impact on America hasn’t ended. Not even close. It will go on for many years to come… America will miss John McCain. The world will miss John McCain. And I will miss him dearly”. John McCain died from glioblastoma on August 25, 2018, while Senator Edward Kennedy (his good friend and foe) also died from the same form of brain cancer on August 25 2009, exactly nine years earlier to the day (as a strange coincidence). If “statesmen are judged not for what they did but for the consequences of their actions” (as people say), John McCain is such a statesman. He would live much longer than life in the heart and mind of people he cares for. His family and friends should be proud of this uncommon man who will be missed and remembered as a decent man, and a good guy. The American people and the people of Vietnam are forever in your debt. Hanoi — Recently, there has been intense interest and discussion concerning a new Bill on “Special Administrative and Economic Units” (referred to as “special economic zones”) expected to be passed by the National Assembly soon. The first three special economic zones (SEZ) of Vân Đồn (Quảng Ninh), North Vân Phong (Khánh Hòa), and Phú Quốc (Kiên Giang) would be invested (until 2030) VNĐ 1,570,000 billion (nearly $70 billion). While I’m not against the SEZ concept per se, and not sure how they have come up with this huge figure, I do not support these three special economic zones for the following reasons. For transitional economies (like Vietnam), the SEZ concept remains attractive, though a bit outdated with more lessons of failures. This concept requires certain conditions as it is not really about what to do but how to do it. While everything is possible, “a miss is as good as a mile”. Given the right conditions for the project to move on track at the right time, it could become an economic leverage and growth engine (like Shenzhen). Du Bai was a success story that many countries wanted to repeat. Some Vietnamese have dreamt of turning Chu Lai into Vietnam’s Du Bai, or turning Phú Quốc into its Singapore. But Singapore’s success was due to “the Lee Kuan Yew factor” (which Vietnam does not have), and Du Bai’s success was due to the absence of “the China factor” (which Vietnam has too much). Though the SEZ idea is nothing new, some people might have forgotten the bad lessons of “Vũng Áng Special Economic Zone & Formosa Steel Complex” (in Ha Tinh) and Tân Rai & Nhân Cơ bauxite mining projects (in Central Highland), as well as bad experiences of Chu Lai (Quảng Nam, 2003), Dung Quất (Quảng Ngãi, 2005), Nhơn Hội (Bình Định, 2005), Chân Mây (Thừa Thiên, 2006), Vân Phong (Khánh Hòa, 2006), Phú Yên (Phú Yên, 2008). Why failures? What would make the new projects successful? Without institutional change to curb power and corruption, similar development models would repeat the failures. Once natural resources are drained and the land scarce, interest groups would naturally scramble to seek rents by levying higher taxes (for VAT, income and property), increasing utility prices (for gas, power, water) and toll fees. SEZ becomes a new piece of cake that they would lobby for parts of the game. While Beijing is militarizing and controlling the South China Sea (as its own lake) banning Vietnamese from fishing and developing oil resources in their own waters, it would try to control critical positions on land. SEZ becomes an attractive piece of cake for them to take. Vietnamese interest groups may collaborate with Chinese firms (for shared interests) to manipulate policy and projects. While government officials’ management capacity is limited (especially at local level), their greed is unlimited, and thus they are likely to be manipulated by interest groups. While the painful lessons of Formosa and bauxite mining projects are not forgotten, the new scandals of public investment projects in Ninh Bình are shocking. Though Ninh Bình is not a special economic zone, it is a “kingdom” by itself. Those local interest groups are not only “grabbing everything” but also “ruining everything” by greed, leaving serious consequences, not only in an economic and social sense, but also in terms of national security. According to Vũ Quang Việt (an UN statistics expert), the SEZs of Vân Đồn, North Vân Phong, and Phú Quốc have put “group interests first”. The new Bill has focused on property and casino market, without attracting high-tech investment. What Vietnam really needs is high-tech and educational investment to increase productivity, industrial development and knowledge-based economy, not property and casino projects. Viet said in 2011-2016 period, the productivity in Vietnam’s industrial sector registered a very low average growth of only 2.9% annually, while the average GDP growth rate would not go beyond 5.0% annually if the productivity could not grow beyond 4.0% annually. That is a strange economic phenomenon, and a paradox of economic development in a country where the productivity ranks among the lowest in the world (15 times lower than that of Singapore). Without a national debate to assess and quantify the pros and cons of the SEZ projects in terms of economic, social, and geo-political consideration, there may be misconceptions (from wishful thinking) or risky decisions (by interest groups’ manipulation) leading to mistakes (like before). First, there may be a new “land rush” in a property market already too hot with price hikes driven by brokers (even when the SEZ idea was speculated). Second, there may be “a property bubble” leading to a crisis of over supply, making the economic picture twisted and chaotic. Third, as a result of such developments, these SEZs are no longer attractive for high-tech investors who would need a cleaner business environment and a decent eco-system for business operation. While the government keeps talking about “technological revolution 4.0”, what is going on at these SEZs is really “economic mindset 1.0”. But, it is a big mistake to use a policy of land-lease (for 99 years) to attract high-tech investors who do not really need long-term land-lease. Business investors focusing on supply chains and global value chains would need linkages with infrastructural and business eco-systems, partnership networks and financial institutions, professional service providers and skilled human resource, all of which are not offered by these SEZs. The only thing they offer is free space in an un-free environment. In this sense, special privileges offered are not really special at all. What are the real reasons for the SEZs then (except for property development)? The obvious answer is “casino and red-light district”, as these SEZs are the only places in Vietnam where these people can do business freely. But, another reason that many people are aware of but still reluctant to spell out (for “sensitivity”) is “the China factor”. Otherwise, there is nothing else there. While the Party and Government have a headache trying to figure out how to control power and corruption, the legal system for the SEZs gives too much power to the “SEZ chairman” as a lord (or a prince) having the rights to grant foreign investors land-lease up to 70 years or even 99 years (if approved by the Prime Minister), to appoint contractors, sign labor contracts and employ public servants…Investors are also allowed to enjoy a tax break for 30 years, to transfer property rights by sales or inheritance. Some experts said a policy of land-lease for 99 years would only serve big property developers (and China), while 85% investors confirm a tax break is unnecessary (according to World Bank). Foreign nationals are allowed to work up to 180 days per years (without work permits), and they can get residence permits for 5 years if they invest VNĐ 110 tỷ ($5 million). Vietnamese are allowed to gamble at the casino, and enjoy a personal income tax break for 5 years (and 50% in the following years). These special favors would lead to a new wave of migration from China and other neighboring countries, especially the unskilled labor market, upsetting the demographic structure of these zones, thus increasing social problems and crime rates (like the “Wild West” time). The SEZs are also “special incubators” for crony capitalism (or “red capitalists”). According to Minxin Pei, the entrenchment of crony capitalism (in China) would make the transition to democracy more difficult and disorderly. It is difficult for the democratization process (led by the middle class) to happen under crony capitalism. It would be a mistake to assume that private entrepreneurs, once they have gained economic wealth and political power, would prefer liberal capitalism to crony capitalism. The legacy of crony capitalism (greater inequality of wealth, local mafia states, and the collusion of privileged tycoons) would enable those who have acquired enormous wealth to wield political influence to crack down on new elements of democracy. The dynamics of regime decay would destroy the institutional integrity of the party-state through three possible mechanisms. First, these collusive networks would colonize all corners of the party-state, trying to subvert its political authority, transforming it into their private instruments of power. Instead of advancing the regime’s interests, they would primarily seek private benefits. Second, corruption networks would compete with each other for power and rents, thus weakening the party’s internal unity and increasing the risk of purges that endanger the personal security of its top elites. Third, when collusive corruption pervades the security apparatus of the party-state, it is almost certain to undermine the effectiveness and loyalty of the pillar institutions upon which the party-state’s survival rests. (China’s Crony Capitalism, Minxin Pei, Harvard University Press, 2016). While some people thought Phu Quoc should be developed as Singapore (talk about positive thinking! ), others would fear Vân Đồn might become something like Cremea (a negative thought). But the “Singapore Story” has been based on completely different premises. Lee Kuan Yew once said, “The number one position in Asia should have been for Vietnam”. According to him, the geo-political position and abundant natural resources should be the top factors which could have turned Vietnam into “the Big One of Asia”. Whereas today Vietnam’s economic output is only 1/15 of Singapore (or 1/5 of Malaysia, and 2/5 of Thailand). Lee confirmed that the success of a nation would depend on three key factors. First, natural conditions (as strategic location and natural resources); Second, the people; Third, the opportunity. But the human factor is always the most critical one. That is why Lee Kuan Yew was so regrettable that Vietnam has failed to appreciate talents, as he believed most Vietnamese talents have migrated overseas. (Việt Nam in Lee Kuan Yew’s eyes, Cao Huy Huân, VOA, September 14, 2014). Even if these SEZs would become (short-term) successes in tourism, property or casino, Vietnam stands to pay huge prices for geo-political and national security follies (as “more harmful than good”) Article 62 of the Land Law is a policy loophole to be manipulated by interest groups, while Article 69 opens the door for China to infiltrate Vietnam. At the Formosa steel complex (Hà Tĩnh) and Lee & Man pulp mill (Hậu Giang) thousands of Chinese work there. Recently, there have been public protests in Quảng Ngãi province for removing the Bình Hải border station to clear the land for FLC’s “Resort & Tourism Complex” at Bình Châu-Lý Sơn newtown. Not only Quảng Ngãi but also Đà Nẵng has moved a border station to clear the land for a private property project. Gen Võ Tiến Trung (former Director of the Defense Academy) confirmed “The positioning of border stations had been considered carefully in the perspectives of local defense planning” (Zing, April 22). Article 62 is also good news for interest groups as it allows local governments to take the land away from farmers and give them to companies for project development, and Vietnamese companies can transfer the land to foreign companies (like Chinese ones). In a seminar in Japan (September 7, 2017), Trịnh Văn Quyết (FLC president) said that apart from selling shares, “FLC can transfer projects to foreign investors”. According to news reports, Quảng Trị province is prepared to allocate 1000 ha along Cửa Việt seaboard to FLC for resort, golf course and an airfield development. Now that Vũng Áng is in Chinese hands, Vân Phong and Cửa Việt may be the next ones in line that China is really interested. Along the Northern to Southern seaboards of Central Vietnam, many strategic positions have been granted to Chinese companies for resort projects without taking national security into consideration. In Da Nang and Nha Trang, many strategic defense positions along the coastline have been taken over by Chinese companies (sometimes through local proxy). While Vietnam’s economic interests and sovereignty in the South China Sea are seriously threatened by China, the decision to set up new SEZs at these critical positions would be inexcusable for either economic or national security reasons. Given poor management yet exceptional corruption skills, these SEZs may become “special corruption zones” by interest groups (or “red capitalists”), and “special incubators” for “crony capitalism”. If most of big projects in Vietnam have fallen into the hands of Chinese firms, there is no reason why they would not take over these new SEZs as “special concessions”. Chinese crony firms supported by their government with powerful motivations and financial resources would take over the SEZs as a “soft invasion”, to “win without fighting” (as Sun Tzu’s art of war or Weiqi board game). For those critical positions on land that China could not take by force (as they had taken Paracel and Spratly islands) they would try to take over by investment and “sharp power”. Therefore, the “great policy” for the new SEZs with special favors (for 99 year lease) looks like “sending the fox to mind the geese” or “giving a hand to the enemy”. In history, Vân Đồn was a frontline outpost having a strategic position guarding the North-Eastern gateway to the sea, from where Chinese naval forces would invade. Ngô Quyền had fought the Southern Han Dynasty’s army, and defeated it at Bạch Đằng naval battle (in 938), Lý Thương Kiệt had fought the Song Dynasty’s army (1075-1077), and Trần Hưng Đạo had fought the Mongol armies (1257-1288). If Vân Đồn enjoys a strategic position guarding the North-Eastern gateway, looking over the Tonkin Gulf, Phú Quốc enjoys an equally strategic position guarding the South-Western gateway looking over the Indian Ocean, while Vân Phong (near Cam Ranh) enjoys a strategic position guarding the gateway of Central Vietnam looking over the South China Sea. In Central Vietnam, while Sơn Dương (in Vũng Áng) is a deep-water port now controlled by the Taiwanese and Chinese, Vân Phong and Cửa Việt are the only major deep-water entrepots having strategic values that China has not been able to control. Phú Quốc commands a special strategic position in the new Indo-Pacific vision. It is so close to Sihanoukville and Bokor (in Poipet, Cambodia), as two strategic positions which China has leased for 50 years. Now, China is very interested in Phú Quốc as the next target to form a strategic triangle in this area. Once China could strike a deal with Thailand to develop the Kra canal, Phu Quoc might be even more important than Singapore in geo-strategic terms. According to James Holmes (a leading American expert in naval strategy) “a clash of arms (in the South China Sea) is possible”, and “China could win even if it remains weaker than America in the aggregate”. In the words of gen Chang Wanquan (Chinese defense minister) China can win a war in the South China Sea by “people’s war at sea”. Holmes commented: “statesmen and commanders in places like Manila, Hanoi and Washington must not discount Chang’s words as mere bluster”. The Chinese can win by “over-empowering the US in a war by contingent at the place and time that truly matters…”. In this sense, “active defense is all about harnessing tactical offense for strategic defensive campaigns”. Now that PLA commanders could pursue a mix of small and big unit engagements against the US-led coalition, Holmes advised “US and allied commanders to study China’s art of war to gain insight into how PLA’s offshore active defense might unfold in the South China Sea”. (China Could Win a War Against America in the South China Sea, James Holmes, National Interest, May 30, 2018). In an armed conflict in the south China Sea, the SEZs of Vân Đồn, Vân Phong, and Phú Quốc would play a critical role in the strategic game of “anti-access/area denial” (A2/AD). If these strategic positions are in China’s hands, Vietnam would be checked mate (and the game is over). That is a real danger in any war scenario, not only for Vietnam but also for ASEAN and other powers having vested interests in the South China Sea (such as the US, Japan, India, Australia, and the EU or Russia). As the South China Sea is vital not only for Vietnam but also for these powers, the story of Vân Đồn, Vân Phong, Phú Quốc SEZs should be put in larger geo-political perspectives of the South China seas and the Indo-Pacific vision. Let’s bear in mind the geo-strategic implications of the SEZs (like the TPP saga) are greater than (short-term) economic interests. It would be unfortunate if law makers and decision makers have no strategic thinking, or strategic think tanks are muted. The new SEZs of Vân Đồn, North Vân Phong, and Phú Quốc would be invested 1.570.000 billion VNĐ (with 270.000 billion for Vân Đồn, 400.000 billion for North Vân Phong, and 900.000 billion for Phú Quốc). Even if the initial investment figure would not be inflated (like the “Ninh Bình syndrome”), how can the state or the business community raise so much money (if not from the “northern neighbor”). This implies potential national security risks and long-term geo-political dangers. If the story of the SEZs is put in perspectives of conflict of strategic interests and the new Indo-Pacific vision, “the China factor” would loom large and clear in the broader geo-political picture. It is really a paradox when Vietnamese leaders keep lobbying hard for the US, Japan, India, and Australia to increase their military presence in the South China Sea to counter China while the National Assembly is prepared to pass this new Bill to allow potential investors (mostly the Chinese) to lease the land (for 99 years) at the most critical positions having strategic values in the country. The nature of Vân Đồn, North Van Phong, and Phú Quốc SEZs is mostly about property market and casino operations. As soon as the news about the SEZs was speculated, investors started to rush in to buy land for hoarding, driving the prices up. So why do they need to set up the SEZs when the market is already moving? For Vân Phong to become an entrepot, it is not necessary either to set up a SEZ. In fact, property development is simply land hoarding for “quick bucks”. They have mistakenly assumed that the key factor to attract investments is a series of favors leading to legal manipulation, tax avoidance and money laundering. But attracting investment at all costs would entail big prices to pay later. For long-term sustainable growth, there must be institutional change to facilitate international integration along the line of the common standards already agreed upon in the WTO, BTA, FTA (and CPTPP). While the Party would “lead everything”, the National Assembly should share responsibility for this “historical decision” which would define patriotism. This is when law makers and decision makers should think over and decide what to choose (like “choosing fish or steel”). If they make the right decision, later generations would be indebted. But if they make the wrong decision, they would be cursed by later generations (even if they run away). Many experts have advised that for the Bill to be passed it requires extensive inputs and revisions to ensure national interests over group interests, to void unfortunate mistakes. Negative consequences in social-economic, institutional, environmental and national security terms as a result of the SEZs (as “special concessions”) would be enormous and unpredictable. Once money is lost, it is difficult to recover. But once territory and sovereignty are lost, it is impossible to recover. When can Vietnam get back the Spratly and Paracel islands? (and the next might be Vân Đồn, Vân Phong, and Phú Quốc). Now, it is time for the National Assembly to prove they would vote for national interests, not group interests (or foreign ones). If what has been going on in the Korean peninsula recently has attracted the attention of the world, what has just taken place in Malaysian politics is equally unexpected. Though the two events are different, they both reflect the indeterminacy of the new world order in which no country is an exception (including, even, Vietnam). Many well informed about Malaysia may be shocked, but nor are they surprised by the defeat and disgrace of Prime Minister Najib Razak, for his corruption scandals have truly angered Malaysians and have reminded Malaysians and the region of such notorious kleptocrats as Marcos and Suharto. On one level it seems history keeps repeating itself. Malaysian people power has arrived. But the success of the (unlikely) coalition between Dr Mahathir Mohamad and Anwar Ibrahim – who was notoriously sacked and imprisoned, both by his present partner Dr Mahathir (in 1998) and (later, in 2015) by Najib is no less dramatic. Reality is indeed often stranger than fiction. Taking a step back, there must be compelling reasons for Malaysian voters to vote a 92 year old former autocrat and (his former) prisoner (jailed twice) into power. And yet somehow the feel is different than the elections of Mr Donald Trump or Rodrigo Duterte. Not all populisms are based on fear and paranoia. Some rise with demands for accountability and political accountability. Mahathir Mohamad (at 92) promises to change the system he had set up. 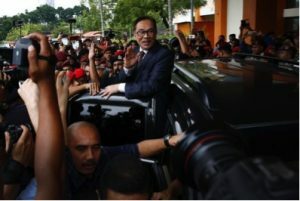 According to The New York Times, the political change in Kuala Lumpur following the historic election of May 9, 2018 is a “political earthquake”. As recently as a few months ago, few people would predict Prime Minister Najib Razak and the ruling Barisan Nasional coalition would lose, even when Najib Razak has been accused of big corruption. But this unexpectedly outcome has indeed unfolded, and in dramatic fashion. Even the victorious opposition party was shocked. Nor was this earthquake limited to KL. What happened? 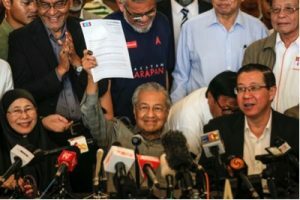 Most basically, given an historic opportunity, Malaysia voters turned out in record numbers (14.5 million voters), delivering the opposition coalition (Pakatan Harapan) led by Dr Mahathir a majority of 113 of 222 seats in parliament, and leaving the ruling coalition (Barisan Nasional) led by Najib Razak a humiliating 79 seats). Now, Dr Mahathir has returned to power at the age of 92, as “the world’s oldest elected head of government”. (Malaysia Elections Everything You Need to Know About a Political Earthquake, Angie Chan, New York Times, May 17, 2018). “The biggest mistake that I have made in my life was choosing Najib… You know the mess the country is in, and we need to attend to this mess as soon as possible… The rule of law will be fully implemented”. It is a half apology because it was Mahathir’s imprisonment of Anwar that presaged Najib’s rise to power. Nonetheless, now in disgrace, Najib Razak, his wife, and other senior officials of the outgoing government have been banned from leaving the country. Najib’s home has already searched by the police. To beat Najib Razak and restore “a new new order”, Dr Mahathir has cooperated with the opposition party he had once suppressed. On May 9, 2018 when he was pardoned by the King (at Mahathir’s request). Today Anwar’s wife, Wan Azizah Wan Ismail, has taken her place in the new government as a deputy prime minister, while waiting for Anwar to return to politics. According to Wan Azizah, Mahathir has agreed to stand aside midway through his five-year term for Anwar to succeed him as the next prime minister. Anwar Ibrahim claims he was put in jail by Dr Mahathir for political motivations. But now, he is willing to forgive Mahathir and is ready to work with him to bring “a new dawn” to Malaysia, a country where genuine political rights has been assiduously suppressed. While Pakatan Harapan is an unlikely and uneasy coalition, it is a remarkable and uncommonly brave one. For only through Dr Mahathir’s cooperation with Anwar’s People’s Justice Party (as the largest party in the coalition) was it possible to create a force strong enough to beat Najib Razak and an entrenched system that has benefited under his corrupt administration. Now that power has been wrenched from Najib, Malaysia finds itself with a genuine multi-party political system. But whether Mahathir is (this time around) a reformer is less certain. Nor should this possibility be ruled out. Malaysian voters have voted for Dr Mahathir, at 92, precisely because there has been an understanding that Mahathir would serve as a “transitional” prime minister for two years to rebuild the government and pave the way for Anwar to succeed him. And Anwar, it would seem is a popular and genuine reformer. Still, the plan for “mid-term” power transfer remains an x-factor, and may ultimately depend on Dr Mahathir’s himself. (Malaysia election: Anwar Ibrahim’s future still in Mahathir Mohamad’s hands, Adam Harvey, China Morning Post, May 16, 2018). It has been widely observed that democracy and human rights have not fared well in Southeast Asia, particularly in countries widely regarded as ripe for transitions to democracy. From the Philippines where journalists have been assassinated and drug users exterminated extra-judicially (by President Rodrigo Duterte) to Cambodia where the opposition and the news media have been suppressed (by Prime Minister Hunsen) to Myanmar where Rohingya muslims have been the subject of genocide, forever damaging the reputation of Aung San Suu Kyi. What, then, does Malaysia’s turn mean? In domestic politics, how Dr Mahathir’s new government behaves remains an open question. It is difficult for members of Mahathir’s multi-party coalition government to share with him a common vision on different issues, except their common interest in deposing Najib Razak’s corrupt government and Barisan Nasional’s grip on power. Now that Mahathir (at 92) is again prime minister, he has the rare opportunity of correcting mistakes of his earlier tenure as prime minister and autocrat. For his part, Anwar Ibrahim has declared his full support to Mahathir and (of course) his wife, Mahathir’s deputy prime minister. This is a new alliance of two (or perhaps three) veteran politicians, including the odd couple of Mahathir and Anwar: mentor and protégé turned rivals and now allies. In the meantime, Anwar plans to go on the lecture circuit to leading universities around the world to spread the message of “moderate Islam” and, one would expect, the merits of more democratic and transparent politics. Nor does the significance of recent developments stop in Malaysia. For international politics, Mahathir has addressed China’s extensive influence and investment in Malaysia, saying that his government would need to study the agreements made by Najib and that he was concerned about the size of Malaysia’s debt to China. As for the Belt and Road program, Mahathir said the new government would have no problem, but he would not like to see too many warships in the area, as “warships attract other warships”. Anwar’s view on China is similar to that of Mahathir, as he is not against Chinese investment, but he is also concerned about the manner some of the deals were made. (In Malaysia, the Old Prime Minister Promises a New Order, Richard Paddock, New York Times, May 10, 2018). More broadly, the developments in Malaysia remind us of the indeterminacy and possibility of politics. Suddenly, Malaysia is a country of possibility. That’s good news for Malaysians and interesting news for us all. Former Prime Minister Najib Razak is known for big corruption with his nick name “Man of Steal”. He has been accused of stealing at least $3,5 billion from a government investment fund he once headed (the “1MDB scandal”) and spending on expensive real estate in the US, a luxury yacht, jewelry and art, with $731 million ending up in his personal accounts. He is reported to have owned a penthouse (worth $30.6 million) at the Time Warner Center in Manhattan (New York) overlooking Central Park, a mansion (worth $39 million) in Los Angeles, another house (worth $17.5 million) in Beverly Hills, a diamond necklace (worth $27.3 million) for his wife. The US Department of Justice charged that these lavish properties were bought by people close to Najib Razak with money stolen from Malaysia’s public fund. If Dr Mahathir transfers power to Anwar “midway through his five-year term” (as pledged) to support institutional reform and turn Malaysia into a democratic and modern country, he would go down in history for leading Malaysia in critical reform drives (twice as “round one” and “round two”). And yet, he would be able to change his poor image as an autocrat (in his earlier tenure). But if he fails to do so, Anwar and his followers are not expected to except and this multi-racial country may be polarized and fall prey to Islamism or China’s manipulation. While Anwar is poised to lead democratization and modernization, Mahathir is likely to return to a “Look East” approach, now in line with the new Indo-Pacific vision and Japan’s role in the “Quad” alignment (of America, Japan, India, Australia). In this perspective, the relationship between Vietnam and Malaysia is expected to improve, making a positive contribution to peace and stability in the South China Sea as well as ASEAN’s regional role. In 2017 North Korea’s missile and nuclear tests and the inflamatory words of president Donald Trump and chairman Kim Jong-un put the word on edge. After a flury of diplomacy in 2018, prospects for peace and reconciliation have rarely seemed higher. 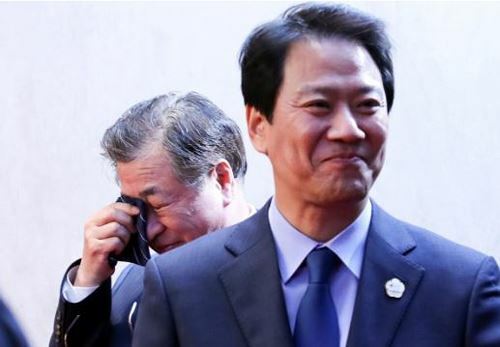 What seemed to be well-founded pessimism amid “war brinkmanship” has suddenly turned into optimism – giddy in some quarters – that peace on the Korean peninusla may finally be at hand. Seemingly well-deserved bad publicity for both Trump and Kim has swiftly turned into a wave of praise. Yesterday’s “despot Kim” is today “Kim the young talent. Whether playing to Trump’s incessant need for praise or not, South Korean president Moon Jae-in’s quip that Trump is “deserving of a Nobel peace prize” has generated waves on its own. There is a certain surreal quality to what is occurring, and the intrigue continues. April 27, 2018 was an historic day in Korean history as the two Korean leaders met and signed a joint statement in Panmunjom, confirming that a complete denuclearization of the Korean peninsula is the common goal (or at least common stated goal) of the both Korean states. Chairman Kim Jong-un told president Moon Jae-in “if we meet so often and build confidence with America, if we end the war and commit not to invade each other, why should we live in fear of nuclear weapons? Kim Jong-un pledged “I’m determined not to repeat the painful history of the Korean war, and I promise that we would never use force again…Living together on the same homeland, we should never spill blood again”. Kim Jong-un then decided to change the time zone of Pyongyang to that of Seoul. Witnessing the historical moment when the two Korean leaders sign the joint statement in Panmunjom, KIA director Suh-hoon could not hold his tears. According to the New York Times (April 29, 2018), the next day (April 28) president Moon Jae-in phoned president Donald Trump to brief him on the result of the inter-Korean summit. Moon Jae-in quoted Kim Jong-un as saying “The PRK would give up nuclear weapons if the U.S. agrees to end the Korean war and pledges not to invade Korea”. Kim Jong-un also said he would invite experts and journalists from South Korea and the U.S. to North Korea next month to monitor the suspension of nuclear tests there. Moon Jae-in also told Trump that Kim Jong-un understood him and the two countries could live in peace and happiness together. Moon Jae-in advised Trump to meet Kim Jong-un the sooner the better, to follow up on the momentum of a successful inter-Korean summit. Moon Jae-in also phoned Japanese Prime Minister Shinzo Abe (April 29) to advise him that Kim Jong-un is willing to talk to Tokyo. Earlier, Mike Pompeo (as CIA directory and now newly confirmed US State secretary) visited Pyongyang to meet Kim Jong-un (April 1, 2018). Pompeo told ABC (April 29, 2018) that his meeting with Kim Jong-un went very well, that Kim is seriously prepared for denuclearization of the Korean peninsula, and has a specific roadmap for this. Pompeo confirmed “When I left, he understood exactly the work as I describe it today. The U.S.’s objective is a complete denuclearization of the Korean peninsula, verifiable and irreversible”. In fact, the door to peace and reconciliation was opened up during the XXIII Olympic Winter Games (Pyeongchang, February 9 to 25, 2018). 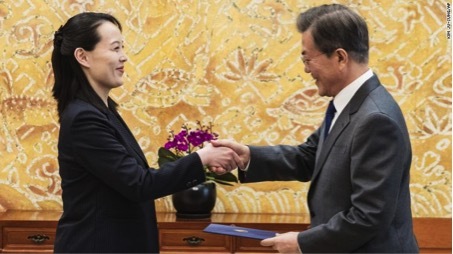 On this occasion, Kim Jong-un’s sister Kim Yo-jong delivered to Moon Jae-in a personal letter from Kim Jong-un. The Pompeo-Kim meeting was in preparation for the coming Trump-Kim summit (in late May), to follow up on the successful Moon-Kim summit in April 27, which has laid the foundation for a peace process. President Donald Trump told Bloomberg (April 29, 2018) that Kim Jong-un “was not kidding”, and he would meet Kim “in 3 or 4 weeks” (likely in Panmunjom). Kim Jong-un and Donald Trump have exchanged nice words and mutual respect (totally different from last year). They have shown mutual understanding of their wishes, and confidence in the success of the coming meeting. However, public skepticism often dies hard, until written commitments are signed or even until specific actions are taken to follow up. That is why both sides need time to build mutual confidence and goodwill for peace and reconciliation. It seems Kim Jong-un has been able to take this hard fact of life with pleasure as if he has proactively prepared for it in advance. Indeed, he appears to have has unexpectedly embraced the process, exhibiting a deftness that has surprised some and intrigued virtually everyone. While outcomes of the flurry of diplomacy remain uncertain, it seems clear that direct negotiation between the U.S. and North Korea was and remains an inevitable step in the process to of resolving the crisis. Be that as it may, the tensions that led to the current diplomacy are in part an outcome of the nuclear threat from North Korea’s use of nuclear blackmail and brinkmanship. This was and remains a dangerous if calculated gambit. While it remains unclear whether and to what extent Donald Trump and Kim Jong-un are sane or mentally unfit as reported they appear, for the moment, unwilling to die. For a negotiated solution to occur, Washington and Pyongyang will have to talk directly and that is now occurring. Significantly, it has been Seoul that has played the intermediary (instead of Beijing). Perhaps, that is why Xi Jinping and Kim Jong-un rushed to meet in Beijing (March 25-28, 2018) before the inter-Korean summit and the US-Korean summit talks. There are reasons for both Trump and Kim to meet to “dilute” Chinese influence over Korea. From this perspective, it is possible and even likely that Kim went to Beijing not for reassurance or rapprochement, but to appease Beijing and to play the China card as a counterbalance before Kim would meet Trump. When North Korea tested nuclear bombs, the Chinese were anxious. Now that Trump is going to meet Kim (without being arranged by Beijing) Xi Jinping may be feeling anxieties of a different sort. Now, Kim Jong- un is himself playing with world powers, using Xi (the “Red Emperor”) into a trump card with Trump. According to David Shambaugh (a top China watcher), Xi Jinping and Kim Jong-un are “not a happy couple”. New York Times also reported (April 22, 2018) that Kim Jong-un wanted to reduce Chinese influence on Korea, while Beijing is concerned that China has been sidelined from the power game during recent Inter-Korean summit and the coming US-Korean summit talks (in late May 2018). If the US-Korean summit is successful, Pyongyang may escape being dependent on and controlled by Beijing. Conversely, if the talks fail, Pyongyang risks being punished by both China and the U.S. In such a context, Kim needs to ensure Trump understands exactly his position and intention, while somehow managing to avoid alienating Xi. This, it would seem, is mission improbable; success would seem not only on the whims of Trump and Kim but on the talents, limitations, and decisions of advisors on both sides. Events on the Korean pinnisula are moving fast. In a flash, Kim Jong-un has appeared on the world stage for the first time and has in many respects had a successful debut with credit, too, to telegenic sister and brain Kim Yo-jong by his side as his right-hand advisor. Now, summit watchers might worry more about Trump than Kim, as Trump is known to be unpredictable and undisciplined as a true loose cannon. Worse, Trump is understaffed with less experienced aides (particularly from the State Department) and John Bolton in the mix, too. According to Moon Jae-in, “Seoul is trying to create a line of communication between the U.S. and North Korea” and he is playing a key role to make sure Pyongyang and Washington are getting even closer. Korea watchers would agree both Pyongyang and Seoul want to reduce Chinese influence on the Korean peninsula. By arranging for Kim Jong-un to meet Donald Trump, Moon Jae-in is helping Pyongyang move away from Beijing and achieve degrees of freedom from its influence. If Kim Jong-un and Moon Jae-in can do this, not only Korea’s destiny but also Northeast Asia’s (and Southeast Asia’s) geo-political picture would be changed. According to the New York Times (April 22, 2018), as China is sidelined from the coming US-Korean summit talks, there is a growing fear in Beijing that the outcome may be either North Korea or (someday) a reunified Korea leaning toward the U.S, reducing China’s influence in the region. While Kim Jong-un has decided to suspend nuclear and missile tests, Moon Jae-in is working hard for gradual reunification. If he succeeds in facilitating a deal between Kim Jong-un and Donald Trump, in the form of “normalization of bilateral relations” in exchange for “denuclearization of Korean peninsula”, for example, the geo-political landscape of East Asia and its balance will indeed have changed. Stay tuned! 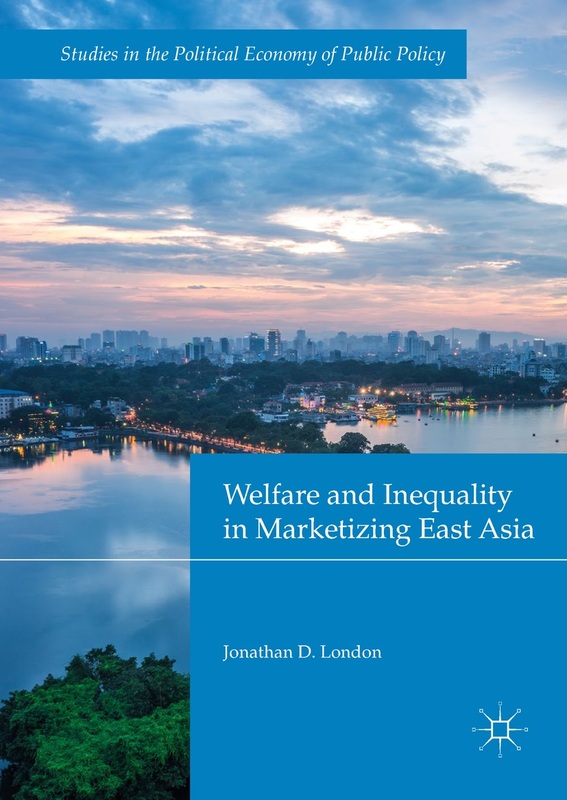 Welfare and Inequality in Marketizing East Asia. London. Palgrave Macillan. 466 pages. While there has been great interest in East Asia’s economic performance and its implications for comparative political economy, attention to patterns of welfare and inequality in the region’s political economies has been largely confined to specialist academic and policy literatures. While these literatures have vastly improved our understanding of patterns of welfare and inequality in East Asia, rarely have they done so in ways that inform comparative understandings of the region’s political economies or contribute to the theoretical development of comparative political economy more broadly. This book is premised on the assumption that welfare and inequality—and, more precisely, the mechanisms that generate them—are central to the analysis of comparative political economy and that an analysis of the recent history of welfare and inequality in East Asia can both enhance our understanding of the region’s political economies and contribute to a more adequate theorization of welfare, inequality, and comparative political economy in a variety of world historical settings. Welfare and Inequality in Marketizing East Asia addresses the comparative political economy of East Asia in the context of late 20th and early 21st century marketization—understood as an historic and dramatic acceleration in the world-scale expansion of markets and market relations that has gained force since the early to middle 1980s and which has transformed social life everywhere. East Asia has figured centrally in this contemporary instance of marketization. This study traces the manner in which marketization has registered across the region’s diverse social landscape and explores how it has shaped welfare and inequality across the region. It does so through an approach that views contemporary East Asia’s political economies as dynamic, globally-embeded social orders and embraces the spirit of Charles Tilly’s (1984) meta-theoretical explorations of “big structures, large processes, and huge comparisons.” Situated in the world-historical context of late 20th and early 21st century marketization, the book employs individualizing, universalizing, and variation-finding modes of comparison to probe the dynamic properties of the region’s political economies as social orders in order to better understand how marketization— in combination with other factors—has shaped welfare and inequality outcomes within them. It contends that a more adequate theorization of welfare and inequality in marketizing East Asia requires an encompassing approach trained on continuity and change in the social constitution of political economies. Rather than replacing narrow analyses of the political economy of growth with similarly narrowly-focused studies of welfare or inequality, we can explore the manner in which the broad array of social relations and processes associated with marketization bear mechanisms underpinning growth, welfare, and inequality across time and place. The typological search for ideal-typical “worlds of welfare” that has been at the center of the literature on comparative welfare regimes is jettisoned in favor of an inductive approach focused on the dynamic attributes and development of social relations within countries, understood as nationally-scaled social orders. Hanoi – What does China really want in the immediate future? At strategic level, it is so obvious in terms of Sino-US rivalry in the South China Sea (SCS). At economic and political level, however, it is less obvious as geo-political interests might be confused or compromised by economic interests and ideological orientations. For clarity, this question should be viewed in perspectives to make sense. The following are some humble comments as food for thoughts. In terms of strategic competition and rivalry between China and the US, the Chinese really want to keep the US out of the South China Sea, now considered their “sphere of influence” (similar to the Monroe Doctrine). Alternatively, the Chinese want to make a deal with the US to share power and interests along the line of “great power diplomacy” (G-2). But this option now seems unrealistic even when they play the North Korea card. Now that the Trump administration has adopted the new National Defense Strategy (NDS 2018) and relied on the Four-Power Pact (or “Squad”) of America-Japan-India-Australia partnership as collective counterweight, China is expected to get more serious in dealing with this new development. Now, any US military presence and activity in the South China Sea, such as FONOP patrols near the small islands occupied by China in the U-shaped zone, would be considered violation of China’s rights and “core interests” and even acts of aggression. China may declare an ADIZ in parts of the zone (as it did in the East China Sea). As a question of principle, China neither recognizes the UN Convention on the Law of the Sea (UNCLOS) and the PCA’s rulings over disputes in the South China Sea, nor accepts multilateral negotiations with ASEAN as a bloc over regional disputes or a Code of Conduct. In fact, China keeps polarizing ASEAN (as its “divide and rule” policy) to weaken its unity as a regional bloc. To turn the South China Sea into its own lake is China’s long-term objective. To this end, China keeps “changing facts on the ground” (with “salami-slicing” tactics) and then making it a “fait accompli” after militarizing these artificial islands as new military bases. Apart from the Paracel islands that they have occupied (since 1974), they have over the past few years intensified their efforts to militarize those islands in the Spratlys that they have occupied (since 1988), turning them into military bases with modern airfields, radar & missile installations, and naval facilities. New aerial pictures show they are near completion for actions. Scarborough Shoal (claimed by the Philippines) is the only feature in the Spratlys that the Chinese have occupied (since 1912) and yet to be militarized. The Chinese seized this shoal after a long standoff when the US failed to challenge them. Now, this is the US’s “last red line” that the Chinese have not decided to cross, though President Duterte has decided to lean on China (instead of the US). Once China could turn Scarborough Shoal into another military base to threaten US bases in the Philippines, it would be the “tipping point”. This is an indication that the Chinese consistently follow the “salami-slicing” tactics. Like it or not, Vietnam is the toughest neighbor standing in the way of China’s ambition in the South China Sea as a crucial step to expedite the grand strategy of the “Maritime Silk Road” and “One belt, One road” as part of the “China dream”. As China’s next door neighbor and a fellow socialist state, Vietnam shares China’s ideological model as well as historical enmity. But China keeps bullying Vietnam, thus pushing it closer to the US. This is an unintended consequence that neither China nor Vietnam had planned in the first place. The HD 981 standoff (May 2014) was the first major turning point, pushing Vietnam closer to the US for strategic hedging in a delicate balancing game with the two competing superpowers. The Repsol drilling crisis (July 2017) was another critical turning point, pushing Vietnam even closer to the US, culminating in the coming visit of the USS Carl Vinson and the Strike Group to Da Nang (March 5-9, 2018). China keeps polarizing not only ASEAN but also Indochina, bullying Vietnam while courting its next door neighbors Cambodia and Laos. As ASEAN is polarized, Indochina is divided by China’s “game of thrones”. Vietnam has come under China’s growing pressure and influence economically and politically, to give China most-favored nation deals in major projects, including the controversial Formosa Steel plant and bauxite mining concessions. These projects have become timed bombs as they are potential environmental disasters. Many China-invested projects have been positioned in strategic locations around the country. Now, the cross-border economic cooperation model of “two states, one zone” is raising new fear of China’s “soft border” designs to change facts on the ground. Financially, Jack Ma’s Alibaba is expected to make a business invasion soon to capture the potential online payment market, while the cross-border illegal trading is still running wild, making up nearly $20 billion in trade deficit every year. These are economic realities that China may use as strangleholds to choke or checkmate Vietnam. The Chinese government is also exploring how artificial intelligence (AI) and big data can be used to monitor social media and citizens for “social-reliability rating”. Chinese strategic thinking about “political warfare” believes an enemy’s political, social, economic institutions and the media should be targeted even before war starts. China has been developing not only cyber capabilities but also using “soft power” for economic, social, cultural, media initiatives. Every year, the Chinese government spends some $7 billion on news media and broadcast outlets overseas. In 2017, Chinese box-office receipts registered $8.6 billion. The giant firm Dalien Wanda has invested some $10 billion in entertainment assets in the US, Europe, and Australia… Kong: Skull Island (directed by Jordan Vogt-Roberts) is an American production invested by Wanda. Other Internet and financial giants (such as Alibaba, Tencent, and China Film Group) have invested billions of dollars in US film ventures. Peter Navarro is perhaps the most vocal trade hawk in the Trump administration. As a fierce critic of China, he has encouraged the president to carry out his campaign promises and take aggressive actions on trade. But administration officials remain deeply divided over exactly what Trump should decide on the aluminum and steel tariffs. Gary Cohn, H.R. McMaster and Rex Tillerson have all expressed concerns about steep tariffs. James Mattis has also raised concern about some of the Commerce Department’s recommendations, and the negative impact of such a move on key allies regarding the recommended options. In September 2017, White House chief of staff John Kelly merged Navarro’s Office of Trade and Manufacturing Policy with the National Economic Council, requiring Navarro to report to NEC Director Gary Cohn. The move kept Navarro out of some high-level meetings on trade, and forced him to work under Gary Cohn (with whom he has disagreed). But now, the White House wants to promote Navarro as “assistant to the president for trade policy”. The new title would ensure that he has a seat at the table for pivotal meetings on trade, and access to the daily senior staff briefings. One administration official said Trump, who likes Navarro, ordered the change, while another said John Kelly has agreed to implement it. If this is true, the Chinese may have reasons to be concerned about a possible trade war. China has stepped up efforts to influence the political systems of other countries. New reports and investigations have raised growing concern in Australia, New Zealand, and the United States, amid signs that these Chinese efforts (or “Charm Offensive”) might lead to new debates and backlashes. In Australia, China has conducted wide-ranging influence operations, using campus organizations to monitor Chinese college students, business associations, and diplomats to supervise Chinese-language media. In the US, more than 100 universities are in partnership with the Chinese government through Confucius Institutes. Recently, US officials, lawmakers, and academics have focused their attention on resisting these Chinese influence on campuses. As FBI has been watching and investigating some Confucius Institutes, the US intelligence community has warned about their potential spying activities. In Vietnam, apart from Confucius Institutes, thousands of Chinese nationals including workers, traders, and others, have migrated to Vietnam every year for business or settlement. As most of them are there to stay, they may eventually change the demographic nature of local community and in the process become a long-term security risk and danger. China Doesn’t Want Confrontation in the South China Sea, James Holmes (professor at Naval War College), National interest, January 29, 2018. Can Vietnam’s Military Stand Up to China in the South China Sea? Derek Grossman (RAND Senior Defense Analyst), Asia Policy vol. 13, no. 1, January 2018. Why a South China Sea Diplomatic Breakthrough Is Unlikely: How to Respond to Beijing’s Continued Military Buildup, Gregory Poling, Foreign Affairs, January 25, 2018. Promotion would give Navarro deeper influence over trade policy, Andrew Restuccia, Politico, February 25, 2018. Trump’s coming hard line on China, Ely Ratner (CFR Senior Fellow, former deputy national security advisor to Vice President Joe Biden), Lowy, November 21, 2017. The Paradox of Xi’s Power, Minxin Pei (Director of the Keck Center for International and Strategic Studies at Claremont McKenna College), Project Syndicate, October 27, 2017. China vs America: Managing the Next Clash of Civilizations, Graham Allison (former director of Belfer Center, Harvard), Foreign Affairs, September-October 2017. China’s Crown Theorist:The Rise of Wang Huning, Ryan Mitchell, Foreign Affairs, December 4, 2017. China’s Influence Game Down Under, Charles Edel (Senior Fellow at the United States Studies Centre, Sydney University), American Interest, November 13, 2017. Australia and New Zealand Face China’s Influence, Joshua Kurlantzick (CFR Senior Fellow for Southeast Asia), Council on Foreign Relations, December 13, 2017. Hanoi-based analyst Nguyen Quang Dy assesses the visit of Donald Trump to East Asia amid regional uncertainties and tensions. As President Donald Trump boarded Air-Force One last week for a presidential escapade to cover five Asian capitals in 11 days (as a record), both insiders and outside observers got nervous watching an American bull coming to china shops. Trump is expected to stick to a prepared script when he delivers his address to the APEC summit, but he is likely to go off-script (and nod off) during some bilateral talks. What could he say or do to reassure nervous Asian leaders, or would he make them even more nervous? Why does he join the ASEAN summit but not the East Asia summit in Manila? Why Ivanka is not coming to Asia with him, and Melania not coming to Vietnam? Why Mark Zuckerberg (of Facebook), Tim Cook (of Apple) and Satya Nadella (of Microsoft) are not his large entourage? Would the longest trip by a US President be successful as expected or just a learning trip? After nearly a year in office, the Trump administration is still unable to define a policy for Asia and the South China Sea. It is partly due to internal rifts among factions in the administration, as well as to Trump’s “America First” commitment, thus neglecting Asia (withdrawing from TPP). The confusion with conflicting views means Asian countries receive confusing and conflicting signals about how the US approaches China. While Steve Bannon (chief advisor), Robert Lighthizer (trade representative), and Peter Navarro (trade council director) prefer threatening China with a trade war, Jared Kushner (senior advisor) wants a flexible approach to Beijing, and John Kelly (chief of staff) thinks China is not a competitor but simply “another power”. Some say the White House has become a center for “adult education”. Meanwhile, James Mattis (defense secretary) and Rex Tillerson (state secretary) offer a more traditional view of America in Asia based on a US-lead alliance along the line of an “Indo-Pacific framework”. In fact, this vision was originally initiated by Japanese Prime Minister Shinzo Abe (back in 2007) to connect four Asia-Pacific powers (including the US, Japan, India, and Australia). At APEC Summit in Da Nang 2017, Trump has the chance to clarify the new vision of a “free and open Indo-Pacific region” as recommended by his key advisors. McMaster (national security advisor) said, “This trip is a great opportunity to demonstrate America’s, and the Trump administration’s, commitment to the Indo-Pacific”. (What China Wants From Trump, Mira Rapp-Hopper, Foreign Affairs, November 7, 2017). The aggressive rise of China (both militarily and economically), accompanied by Trump’s “America First”, now threatens regional security and vital interests of smaller states in the South China Sea. This troubled geo-strategic environment is the background for India’s pro-active willingness to “pivot” to East Asia and join the renewed concept of “Quadrilateral Strategic Dialogue” (QSD) initiated by Shinzo Abe in 2007. The Japanese were then not ready to support constitutional amendment (article 9) to rearm Japan, and the Australians (under Kevin Rudd) decided to withdraw from the QSD for fear of China’s reaction. But the more they fear China, the further China keeps pushing. China will soon move the giant Tiankong dredger to Paracel islands for continued dredging work, challenging the US and allies. Recently, as the Trump presidency is weakened by Robert Mueller’s investigations into Russian involvement in the 2016 election, Trump is looking for a foreign policy scoop. The Vietnamese are concerned that he is tempted to strike a bargain with China over North Korea at the expense of security in the South China Sea. For long, Beijing keeps pushing Washington for “a new type of great power relations” along the line of “G-2 diplomacy”. In fact, Chinese diplomats have lobbied hard to get access to the inner circle of the presidency through family contacts. Bill Hayton (BBC/Chatham House) commented, “The Trump administration demonstrated that it either does not understand or sufficiently care about the interests of its friends and potential partners in Southeast Asia to protect them against China,” (The Week Donald Trump Lost the South China Sea, Bill Hayton, Foreign Policy, July 31, 2017). North Korea would be on top of Trump’s mind during his long trip to Asia, especially in Tokyo, Soul, and Beijing. According to Michael Green (CSIS vice president), “one of the key purposes of the trip is to pressurize North Korea”. (Press Briefing on President Trump’s Trip to Asia, CSIS, November 1, 2017). While this pressure is “absolutely essential”, broader American interests in Asia should endure well beyond the on-going Korean missile crisis and the Kim Jong-un regime in Pyongyang. Therefore, it would be a big folly and disaster if Mr. Trump is over obsessed by North Korea’s nuclear threat (as blackmail) and underestimates the larger danger from China and the growing threats in the South China Sea. There are three basic scenarios for war: The first would be how to defend the US and allies against an attack. The second would be how to preempt North Korea from attacking. The third would be how to prevent war. McMaster has said the US is prepared for war if diplomacy doesn’t work, and Washington has sent three carrier battle groups to the region. But how can Trump articulate this position? Can he talk about a preventive war when Japan and South Korea are not ready to sign on? Now North Korea still pursues the “decoupling” strategy to make the US so scared of a nuclear attack that it will not risk defending Japan and South Korea. This blackmail and brinkmanship game is to keep the US off balance. Perhaps the key achievement of this trip is for the American President to show up in Asia. People say in Asia the fact that he shows up there would be 80% of success. What exactly he can do is another matter, for much is still in doubt. While in Tokyo, Soul, and Beijing, the focus of discussion would be on the North Korea danger, at APEC Summit in Da Nang, Trump was expected to announce his new vision of a “free and open Indo-Pacific region” (to replace Obama’s Asia Pivot policy). Earlier in Tokyo, Trump was believed to have consulted Shinzo Abe as this concept was his original idea. As people are anxiously waiting for Trump to clarify the new vision, he has failed to explain how his new Indo-Pacific concept is different from Obama’s Asia Pivot, though in the speech he mentioned it many times. Now, it is still unclear if the idea of a “free and open Indo-Pacific region” is a consistent strategy or just a mere slogan. As the White House boss is an unpredictable character, the job of the “axis of adults” is to restrain and persuade him, though depending on which issue at a certain time (like managing the stock exchange). It seems they have not been able to persuade their boss to focus more on China (as the roots) than on North Korea (as the top of the tree) and join the East Asia summit where the South China Sea is discussed. Hopefully, at least, they can persuade Trump to wear the local shirt issued by the host for a photo-op. In Tokyo where the Asia trip would start, Trump affirmed the role of the US, “No one, no dictator, no regime, and no nation should underestimate ever American resolve”. Trump also affirmed the role of Japan as a “treasured partner” and “crucial ally” of the US. Particularly Trump affirmed the US-Japan alliance and America’s commitment to the “Indo-Pacific region”. Trump at last understood the fundamental need for US-Japan security cooperation, thus the mutual security treaty is “suddenly coming back to life” as a “critical element” of US foreign policy. Trump said, “I believe that there never have been such close bonds”… “The US and Japan are 100% together” and “I am thrilled my first stop was with you”… Finally, in a public display of affection, Abe gave Trump a baseball cap as souvenir, inscribed with something symbolic: “Donald and Shinzo: Make Alliance Even Greater”. (Japan Knows How to Pet the Donald, Orville Schell, Foreign Policy, November 7, 2017). Since Donald Trump was elected, Shinzo Abe has quietly resorted to personal diplomacy to make friend with the most unpredictable president of the US (and connect with the “axis of adults” in the White House). Xi Jinping would try to do more or less the same, though with a different style of diplomacy and for a different motivation. In Beijing, the American real estate king now practicing as the US President would meet the newly crowned Emperor of China. The two heads of state of the most powerful empires of the world seem to be “strange bed fellows” locked in a dangerous “Game of Thrones” for world supremacy, with their ambitious dreams. They would act like the two bif robots of different generations, programmed differently and operated by two different operating systems. What about Vietnam? Over half a century ago, people of Da Nang were puzzled to welcome the first Americans marines landing on the China beach. This week, people of Da Nang are puzzled again to welcome another invasion of some 10.000 guests landing there for the APEC summit. Some say Dà Nang has experienced two repeated typhoons: the Damrey and the APEC. While the toll of Damrey in central Vietnam is known (with 27 deaths), the result of APEC is not. The APEC summit is like a big circus with 21 players as heads of member states (including 7 super stars) with 39% of global population, 59% of global GDP, and 48% of international trade. Vietnam has joined APEC for 20 years or so, but its economy keeps falling behind. APEC or ASEAN or ODA cannot help if Vietnam fails to execute a comprehensive institutional reform and mobilize its inner strength. At the APEC Summit, TPP-11 (without the US) was in trouble as Canada might turn TPP-11 into TPP-10 (or TPP-0). Given new developments, Vietnam may end up empty-handed without any TPP or EVFTA. At the APEC summit, Donald Trump is a superstar. Vietnam is the first Southeast Asian nation to welcome him for a state visit. He is the first American president to visit Vietnam during the first year in office. Next year, an American aircraft carrier is expected to visit Cam Ranh (for the first time after the war) as a symbolic gesture of stronger military cooperation and a new sign of Vietnam’s departure from timidity (while still walking the tight rope). As the Philippines (under president Duterte) has pivoted to China, Vietnam has suddenly become the US’s key strategic partner in the region as a “frontline” state against China’s military expansion in the South China Sea. Hopefully, Hanoi’s strategic vision would be well aligned with Washington’s strategic vision of a “free and open Indo-Pacific region”. While the Vietnamese should learn from the Japanese in personal diplomacy to win the heart and mind of Trump (and his key advisors), they should not harbor any illusion and forget the expansive lessons of the past. Neither Xi Jinping nor Donald Trump should be taken for granted as a reliable partner. Given the suspicion of a possible US-China “G2” secret deal (over North Korea’s nuke threat), neither Vietnam nor any other claimant in the South China Sea would trust Trump as a reliable mediator (with “special chemistry”) to help solve the conflict of interests there without accommodating China’s unlawful demands, at the expense of their vital interests. According to SCIS, there are three basic pillars for the US pivot to Asia. The first was security (such as the “maritime security initiative” to build capabilities). The second pillar was about economics. That was gone when Trump withdrew from TPP without anything to replace it. The third pillar was much more intensive focusing on Southeast Asia, including ASEAN and East Asia Summit. Trump’s absence from the East Asia Summit will go a long way to undercut regional diplomatic momentum. This depends on how much Trump listens. Michael Green said Trump listened to Abe at Mar-a-Lago and he would not rule out that the Trump Administration would come back from this trip and starts refining its Asia policy. The value of this first trip to Asia is to give the new president a chance to focus on why Asia is so important. Hopefully, this is what Mr Trump is finding out. A couple of weeks ago, State Secretary Rex Tillerson came to CSIS to give a speech. He used the term “predator economics” to refer to the way China is rolling out its ambitious infrastructural plan (for “One Belt One Road” program) with concessional finance undercutting international norms. It is time for the US to develop a strategy to push back what China is trying to do economically. If Trump does not return to TPP, he should come up with a new strategy in its place. According to Michael Green, there are three basic schools of thought in the US administration debating China policy. The first one basically agrees with the “Thucydide’s trap” theory by Graham Allison (including Jared Kushner). The second one believes the US should stick with other key allies and partners as Japan, India, Australia (including Rex Tillerson and H.R. McMaster). The third one believes the US should deal with China along the line of “great power relations” (G-2). Now, the third one is diminished while the second one prevails, with the foreign policy establishment supporting the Indo-Pacific concept. Unfortunately, right now the State Department is headed by a lonely chief with few Indians. Anyway, State Secretary Rex Tillerson spoke of a “free and open Indo-Pacific region” as against the Sino-centric order. The US should support Japan to revive the informal regional grouping of four democratic powers (including America, Japan, India, Australia). This concept was proposed by Shinzo Abe in 2007 (but short-lived). The reason for Abe to resort to personal diplomacy to get closer to Trump (and the axis of adults) is his long fear that Washington may be attempted to cut a deal with Beijing for “America first”. (US Allies Fear Trump Will Pull a Nixon in China, Andrew Browne, Wall Street Journal, November 7, 2017). Now, the Vietnamese have two critical tasks to undertake. First (domestically) Vietnam should focus on a comprehensive institutional reform (in economics, politics, and democratization). The later they do the higher price to pay. Vietnam should not wait and follow China. Sooner or later China must change. By then, it would be too late for Vietnam. Secondly (externally) Vietnam should support and join a strategic framework (beyond ASEAN) to include key strategic partners sharing collective security interests (in economics, politics, defense). To protect national independence and sovereignty, no member country in ASEAN (or ASEAN itself) is capable of standing up to China on its own (especially in the South China Sea). To these ends, the Vietnamese should undertake these tasks urgently yet carefully. If reform was delayed and changed too little too late, it would be meaningless. However, if it was done in a rush without due diligence and consideration of objective rules, it would easily fail. The topic of comprehensive institutional reform has been discussed extensively and the frameworks for change have been carefully drafted (as the Report “Vietnam 2035”). Now, we should focus on discussing how to build such a strategic concept of alliance. This informal “de facto” alliance is created for self-defense, not against any other party. The development of US-Vietnam strategic cooperation has been reflected in the MOU on Bilateral Defense Cooperation (2011), the Joint Vision Statement on Defense Relations (2015), and the Joint Statement for Enhancing the Comprehensive Partnership (2017). While most of defense cooperation matters between the US and Vietnam have focused on non-traditional areas, the strategic significance of the comprehensive partnership has been growing, especially on maritime security cooperation in the South China Sea. For example, the “Maritime Security Initiative” has assisted Vietnam to build maritime capabilities. In May 2017, the US transferred to Vietnam the Hamilton-class cutter Morgenthau (renamed CBS-8020) as the largest VCG vessel (3.200 tons), and six high-speed patrol boats. Japan has also transferred to Vietnam Coast Guard (VCG) four DN-2.000 patrol boats (2.500 tons). As the US-China-Vietnam strategic triangle is more unstable and ASEAN is more polarized by Chinese influence, Vietnam should intensify its strategic cooperation with other powers beyond ASEAN (including America, Japan, India, Australia) as a new Quadrilateral partnership. During his visit to Vietnam (May 2016) President Obama announced the lifting of the arms ban, thus opening up a new opportunity for enhanced strategic cooperation. During the visits to the US by Prime Minister Nguyen Xuan Phuc (May 2017) and Defense Minister Ngo Xuan Lich (August 2017), both sides reached new agreements on strategic cooperation, including the visit of a USS aircraft carrier to Cam Ranh (in 2018). Therefore, APEC summit 2017 is a good opportunity for President Trump to make new commitments for strategic cooperation in the South China Sea as the basis for a “de facto” US-Vietnam strategic partnership. Would APEC Summit 2017 pass as “one night stand” and as a big circus running another show, or be remembered as an important turning point for Vietnam to change? Would Trump be remembered as an American bull in china shops with an “America First” speech, featuring “Indo-Pacific” repetoire (10 times yet without a clear meaning), or as a reliable partner whose contributions would make this country a better place for Vietnamese people and the South China Sea less dangerous as a powder keg? Could the environment in Da Nang (and elsewhere) be improved as a good place to live, so people do not have to migrate and the cute monkeys in Sơn Tra are not extinct? It would be meaningless without refereeing to environmental, human right and South China Sea problems. If these things are not going to happen, APEC and Trump’s “Indo-Pacicfic dream” will be another anecdote to be forgotten soon. “Trung Quốc là một người khổng lồ đang ngủ. Hãy để cho nó ngủ yên, vì khi thức dậy nó sẽ làm đảo lộn thế giới”. Đại hội 19 của Đảng Cộng sản Trung Quốc (CCP) đã kết thúc (18-24/10/2017) nhưng dư âm của nó chưa hết. Sự kiên này như một đám mây lớn đang phủ bóng đen ám ảnh người Việt Nam cũng như nhiều quốc gia khác trong khu vực, nhất là trong bối cảnh Donald Trump bắt đầu chuyến đi Châu Á (3/11), sẽ đến Đà Nẵng họp APEC (10/11) và đến Hà Nội thăm “chính thức” (11/11/2017). Chúng ta nên hiểu sự kiện quan trọng này thế nào? Lời cảnh báo của Napoleon nay đã trở thành sự thật. Trung Quốc đã trỗi dậy và đang làm đảo lộn thế giới. Người Trung Quốc có lý do để trỗi dậy vì lợi ích quốc gia của mình, nhưng đáng tiếc là họ không trỗi dậy “một cách hòa bình” như người Mỹ đã ảo tưởng. Trung Quốc đã trở thành đầu gấu trong khu vực, bắt nạt các nước láng giềng và thách thức vai trò đứng đầu của Mỹ, nhằm biến Biển Đông thành cái ao riêng của họ. (Trung quốc trỗi dậy và suy tàn: Giới hạn của quyền lực, Nguyễn Quang Dy, Viet-studies, 13/4/2016). Người ta nói rằng khi sắp chết con người thường nói thật. Trước khi qua đời, cố tổng thống Nixon đã thừa nhận với nhà báo William Safire (New York Times) trong lần phỏng vấn (năm 1994) rằng trong “tuần lễ làm thay đổi thế giới” khi Nixon và Kissinger đến Bắc Kinh (năm 1972) để chơi “lá bài Trung Quốc”, Mỹ đã làm thế giới “thay đổi tồi tệ nhất” (changed for the worst). Safire kể lại rằng lúc đó bằng một giọng buồn rầu, Nixon đã nói rằng, “chúng ta có thể đã tạo ra một con một quái vật Frankenstein” (we may have created a Frankenstein). (The Biggest Vote, William Safire, New York Times, May 18, 2000). Không phải chỉ có Nixon và Kissinger mà các đời tổng thống Mỹ sau đó cũng góp phần giúp Trung Quốc trỗi dậy thành Freankenstein, bằng chính sách “tham dự một cách xây dựng” (constructive engagement), tức là “phù Trung”. Không phải chỉ có Mỹ mà các đồng minh (như Nhật và Tây Âu) cũng theo chính sách đó. Bây giờ người Mỹ mới nhận ra là Trung Quốc còn nguy hiểm hơn cả Nga, thì đã quá muộn. Cuối đời, Nixon đã thừa nhận sai lầm về Trung Quốc, nhưng Kissinger thì chưa bao giờ tỏ ra ân hận vì đã thỏa thuận với Mao Trạch Đông và Chu Ân Lai để bỏ rơi Đài Loan. Theo Safire, Kissinger còn “bảo hoàng hơn cả vua”. Khi Mao nói với Nixon và Kissinger là Trung Quốc sẽ dùng vũ lực đối với Đài Loan bất cứ lúc nào trong 100 năm tới, thì Kissinger còn tỏ ra ngạc nhiên “sao phải chờ lâu thế?”. Người ta nói rằng Tập Cận Bình là một người trầm lặng và bí hiểm, đã loại trừ được các thế lực chống đối, để thiết lập quyền lực độc tôn, trở thành “Chủ tịch của mọi thứ” (Chairman of everything). Không chỉ con người Tập trầm lặng mà tính độc tài của ông ta cũng trầm lặng, và uy quyền của Tập cũng trầm lặng một cách bí hiểm. Tập Cận Bình có ba mục tiêu lớn. Thứ nhất là biến Trung Quốc thành cường quốc bá chủ thế giới. Thứ hai là củng cố quyền lực cá nhân và tự thần thánh hóa. Thứ ba là kéo dài sự lãnh đạo độc tôn của Đảng. Sau “Tư tưởng Mao Trạch Đông”, đến “Lý thuyết Đặng Tiểu Bình”, rồi “Ba đại diện của Giang Trạch Dân” và “Phát triển khoa học của Hồ Cẩm Đào”, nay “Tư tưởng Tập Cận Bình về chủ nghĩa xã hội mang đặc sắc Trung Quốc trong thời đại mới” đang đưa Trung Quốc đến với mô hình phong kiến tập quyền. Tập đã xếp mình ngang với Mao Trạch Đông như hoàng đế Trung Hoa, cao hơn cả Đặng Tiểu Bình, Giang Trạch Dân và Hồ Cẩm Đào. Ngày 24/10/2017, “Tư Tưởng Tập Cận Bình” đã được Đại hội 19 ghi vào điều lệ Đảng. Diễn văn dài ba tiếng rưỡi (30.000 từ) của Tập là một bài luận văn đầy tham vọng, do các trợ lý chủ chốt như Vương Hỗ Ninh (Wang Huning) và Đinh Tiết Tường (Ding Xuexiang) dày công soạn thảo. Trong khi Tập Cận Bình đọc bài diễn văn ba tiếng rưỡi thì Donald Trump chỉ cần twit vài dòng. Đó là sự khác biệt về văn hóa chính trị và hệ điều hành (operating systems). Thắng lợi thứ nhất là Tập khẳng định tầm nhìn của “Tư tưởng Tập Cận Bình” từ chủ nghĩa “tân chuyên chế” (neo-authoritarianism) đến “tân toàn trị” (neo-totalitarianism) và “tân bảo thủ” (neo-conservatism) trong “thời đại mới” khi Mỹ và phương Tây đang khủng hoảng, là cơ hội tốt để Tập áp đặt tư tưởng của mình. Tập không chỉ định người kế thừa (theo tiền lệ), mà để ngỏ khả năng kéo dài thêm một nhiệm kỳ nữa (sau 2022). Thắng lợi thứ hai là Tập đưa hai nhân vật trung thành nhất vào thường vụ Bộ Chinh Trị, giữ hai vị trí then chốt. Một là Lật Chiến Thư (Li Zhanshu) làm chủ tịch quốc hội, Hai là Triệu Lạc Tế (Zhao Leji) làm bí thư Ủy ban Kiểm tra Kỷ luật TƯ (CCDI) thay Vương Kỳ Sơn, phụ trách chống tham nhũng. Tuy Tập Cận Bình trở thành lãnh đạo có quyền lực lớn nhất Trung Quốc, nhưng có một “nghịch lý về quyền lực” (paradox of power) là khả năng thao túng xã hội Trung Quốc của Đảng Cộng sản đã bị hạn chế rất nhiều so với những ngộ nhận của Tập và những người ủng hộ (cũng như nhiều học giả nước ngoài). Theo Minxin Pei, có hai lý do chính. Thứ nhất là xã hội Trung Quốc đã thay đổi quá nhiều so với thời Mao và Đặng, nên hầu như chẳng còn ai (kể cả đảng viên) thực sự tin vào một học thuyết chính thống. Thứ hai, bản chất kinh tế Trung Quốc đã thay đổi quá nhiều (hơn 60% là tư nhân) nên Đảng không còn ảnh hưởng nhiều đến đời sống của người dân. (The Paradox of Xi’s Power, Minxin Pei, Project Syndicate, Oct 27, 2017). Vương Kỳ Sơn là cánh tay phải của Tập Cận Bình, phụ trách chống tham nhũng, có quyền lực xếp thứ hai (sau Tập). Mô hình CCDI (Ủy ban Kiểm tra Kỷ luật TƯ) giống mô hình “Đông Xưởng” của hoàng đế Chu Lệ (Yongle) thời nhà Minh, với quyền lực đáng sợ. Nhưng trái với đồn đoán, Vương Kỳ Sơn đã nghỉ (vì quá tuổi và nguyện vọng cá nhân). Tập phải chấp nhận thực tế đó, tuy ảnh hưởng của Vương còn lớn. Tập có thể cử Vương phụ trách Hội đồng An ninh Quốc gia (NSC), nhưng khả năng đó thấp vì Vương đã rút khỏi Trung Ương. Có lẽ Vương Kỳ Sơn mới là người khôn ngoan và thức thời vì biết nhập thế và xuất thế. Hiện nay, người thân cận nhất với Tập là Lật Chiến Thư. Trong Thường vụ Bộ Chính Trị, Lật xếp thứ ba, nhưng thực chất là người thứ hai (chứ không phải thủ tướng Lý Khắc Cường). Bốn người còn lại trong Thường vụ Bộ Chính Trị đều tuyên bố trung thành với Tập. Đó là Uông Dương (phó thủ tướng), Hàn Chính (cựu Bí thư Thượng Hải), Vương Hỗ Ninh (nguyên trưởng ban nghiên cứu TƯ, thay Lưu Vân Sơn phụ trách tuyên truyền), Triệu Lạc Tế (nguyên trưởng ban tổ chức TƯ, thay Vương Kỳ Sơn phụ trách chống tham nhũng). Việc Giang Trạch Dân vẫn ngồi ghế Chủ tịch đoàn không phải vì phái Giang còn mạnh (như Đại hội 18) mà đã suy yếu. Tuy Tập vẫn phải thỏa hiệp về cơ cấu Thường vụ Bộ Chính Trị, nhưng trong Bộ Chính trị (25 người) đã có 15 người trung thành với Tập (60%). Với Trần Mẫn Nhĩ (bí thư Trùng Khánh), Thái Kỳ (bí thư Bắc Kinh), Lý Cường (bí thư Thượng Hải), Lý Hy (bí thư Quảng Đông), Đinh Tiết Tường (chánh Văn phòng TƯ), Trần Hy (trưởng ban Tổ Chức TƯ), tướng Trương Hữu Hiệp (phó chủ tịch Quân ủy TƯ), Tập đã chiếm thế thượng phong. Tuy dư luận lo ngại Tập Cận Bình sẽ ở thêm khóa nữa (sau năm 2022), nhưng một số chuyên gia cho rằng Tập đã lặng lẽ chọn người kế vị là Trần Mẫn Nhĩ (Chen Miner), tuy Trần Mẫn Nhĩ và Hồ Xuân Hoa không lọt vào Thường vụ BCT (như đồn đoán). Liệu Lật Chiến Thư có thể giúp Tập thay đổi hiến pháp để ông ta ở lại thêm một khóa nữa, hay Tập sẽ chọn người kế vị trung thành để tiếp tục kiểm soát quyền lực sau khi từ chức? Chưa biết Tập sẽ chọn Trần Mẫn Nhĩ hay Hồ Xuân Hoa, nhưng ông ta đã có trong tay các lá bài. Việc cử Trần Mẫn Nhĩ làm bí thư Trùng Khánh (thay Tôn Chính Tài) là một tín hiệu. (Xi Jinping Has Quietly Chosen His Own Successor, Andrei Lungu, Foreign Policy, October 20, 2017). Ngày 15/7/2017, Ủy viên Bộ Chính trị Tôn Chính Tài đã bất ngờ mất chức Bí thư Trùng Khánh, và được thay thế ngay bằng một người trung thành với Tập là Trần Mẫn Nhĩ (nguyên bí thư Quý Châu). Người ta nói Tôn Chính Tài bị ngã ngựa vì là người của phái Giang, đã xung đột với Tập trong một hội nghị ở Bắc Kinh. Sau đó, bí thư Bắc Kinh là Thái Kỳ và Bí thư Quảng Đông là Hồ Xuân Hoa đã lần lượt tuyên bố ủng hộ Tập. 10 ngày sau, Tập Cận Bình tuyên bố điều tra Tôn Chính Tài, và tiến hành họp kín để truyền đạt ý chỉ “4 cái bằng mọi giá”: (1) bằng mọi giá bảo vệ lãnh đạo cấp cao đang ở đầu sóng ngọn gió; (2) bằng mọi giá thanh trừng thế lực phản đối Đảng; (3) bằng mọi giá đối phó với áp lực bên ngoài trước và sau Đại hội 19; (4) bằng mọi giá trấn áp những nhân tố bất ổn định trong nội bộ Đảng. Rõ ràng qua “4 cái bằng mọi giá” Tập muốn phòng ngừa nguy cơ chính biến và giữ ổn định cho Đại hội 19. Vào tháng 3/2017, lần đầu tiên Uông Ngọc Khải (giáo sư Học viện Hành chính Quốc gia) đã lên tiếng bàn về việc Trung Quốc nên thay đổi từ “chế độ chủ tịch quốc gia” sang “chế độ tổng thống”, và cần thiết phải thay đổi toàn diện chế độ chính trị. Tháng 7/2017, Uông Ngọc Khải lại một lần nữa bàn về chế độ tổng thống. Lần này, Uông Ngọc Khải thậm chí còn nói rằng: “Trước khi chuyển sang chế độ tổng thống, cần thiết phải kết thúc chế độ Ủy ban Thường vụ”. Tại sao Tập Cận Bình lại cho phép Uông Ngọc Khải nói về “chế độ tổng thống”? Không biết đó có phải là ý đồ thực sự của Tập hay chỉ là kế nghi binh, nhưng động thái này hơi giống lời khuyên của La Vũ (con của nguyên soái La Thụy Khanh và bạn thân của Tập). Trong bài diễn văn dài ba tiếng rưỡi của Tập Cận Bình, có ba điểm quan trọng. Thứ nhất, “Tư tưởng Tập Cận Bình” được nâng lên ngang tầm “Tư tưởng Mao Trạch Đông”. Thứ hai, Tập Cận Bình tự tin khẳng định Trung Quốc đã bước vào “thời đại mới”. Thứ ba, “những mâu thuẫn chính” của Trung Quốc dưới thời Tập Cận Bình được điều chỉnh là mâu thuẫn giữa “đòi hỏi cuộc sống ngày càng cao của nhân dân” với “phát triển chưa hài hòa và mất cân đối”. (China’s Contradictions, Stephen Roach, Project Syndicate, October 23, 2017). Về kinh tế, có ba mâu thuẫn cơ bản. Thứ nhất là mâu thuẫn giữa vai trò nhà nước và thị trường về phân bổ nguồn lực. Thứ hai là mâu thuẫn giữa cung và cầu. Thứ ba là mâu thuẫn giữa con đường đi (the path) và đích đến (destination). Trung Quốc có thể đang trên con đường tiến đến “thời đại mới” (hay “New Normal”). Nhưng đích đến cuối cùng vẫn còn xa, với nhiều mâu thuẫn cần phải được giải quyết trong quá trình tiến đến cái đích đó. Trong khi Đặng Tiểu Bình cầm quyền bằng ủy nhiệm, không trực tiếp điều hành nhưng vẫn kiểm soát được quyền lực, thì Tập Cận Bình trực tiếp nắm mọi thứ (chairman of everything). Lúc không có chuyện gì thì không sao, nhưng nếu có chuyện xảy ra là thảm họa. Trong những năm tới là thời kỳ chuyển đổi phức tạp, dễ có nhiều biến động lớn, nên đội ngũ cầm quyền của Tập tuy hùng hậu nhưng chưa đủ đối phó. (Why Chinas Xi might come to regret all that power, Kerry Brown, South China Morning Post, October 29, 2017). Tuy quyền lực của Tập Cận Bình lúc này gần như tuyệt đối, nhưng đó là gánh nặng quá lớn cho một lãnh đạo quốc gia. Tập có thể thông minh hơn Trump, nhưng điều đó không đảm bảo một tương lai ổn định cho Trung Quốc. Nếu có chuyện không may xảy ra, thì cả hệ thống quyền lực sẽ như rắn mất đầu, trong khi mọi người đều biết lỗi hệ thống này là do Tập muốn làm “chủ tịch mọi thứ”. Đó là lý do tại sao các triều đại độc tài thường có kết cục gần giống nhau. (China’s New Emperor, Chris Patten, Project Syndicate, Oct 25, 2017). Trong thời “hậu Mao”, Tập Cận Bình nay muốn quay lại chế độ độc tài cá nhân. Cải cách tư pháp và sửa đổi hiến pháp hay điều lệ Đảng chỉ nhằm xây dựng một chế độ pháp trị (rule by law) chứ không phải pháp quyền (rule of law). Đó là một bước thụt lùi chứ không phải tiến bộ, nhằm giúp Tập thâu tóm và kéo dài quyền lực tuyệt đối (supremacy) bằng cách trì hoãn chọn người kế tục (năm 2022) để Tập cầm quyền thêm mười năm nữa (đến 2032). Việc thay đổi luật chơi này tiềm ẩn nguy cơ bất ổn do đấu tranh quyền lực vẫn tiếp diễn. Tuy hiện nay không ai dám thách thức quyền lực tuyệt đối của Tập, nhưng sự phản kháng ngầm trước tham vọng của Tập sẽ đến từ sự bất mãn của bộ máy hành chính khổng lồ. Vì vậy, tương lai Trung Quốc phụ thuộc nhiều vào chất lượng chính sách mới của Tập có hiệu quả không. (China’s Return to Strongman Rule, Minxin Pei, Foreign Affairs, November 1, 2017). Theo Fareed Zakaria (CNN) Tập cho rằng Trung Quốc là một siêu cường trong “thời đại mới”, có thể thay thế Mỹ như một sự lựa chọn (alternative) nếu không phải là đối chọi (rival). Trump có ảo tưởng (fantasy) “làm Mỹ vĩ đại trở lại” (make America great again) thì Tập cũng muốn “làm Trung Quốc vĩ đại trở lại” (make China great again). Đó là “Giấc mộng Trung Hoa” (China Dream) của Tập. Nhưng nếu Tập lấy Mao làm hình mẫu (model) thì Trung Quốc có thể trở thành một Bắc Triều Tiên khổng lồ, chứ không giống Mỹ. Tập Cận Bình kêu gọi Trung Quốc “quán triệt tinh thần Mao Trạch Đông” (embrace the spirit of Mao Zedong) và dành ưu tiên cao nhất cho ý thức hệ. Trung Quốc đứng trước 4 lựa chọn: (1) “Hard Totalitarianism (Toàn trị Cứng) như hiện nay, (2) “Soft Totalitarianism (Toàn trị Mềm) như thời Hồ Cẩm Đào, (3) “Neo-Totalitarianism (Tân Toàn trị) như thời Mao, (4) “Semi-Democratic (Dân chủ Nửa vời) như Singapore. Tập có thể chuyển từ “Hard Totalitarianism” sang “Neo-Totalitarianism”. Nếu Tập định “quay về tương lai” (back to the future) thì đó sẽ là một sai lầm lớn. Vì vậy, David Shambaugh tin rằng “Màn chót” (Endgame) của chế độ Trung Cộng đang đến, và sự sụp đổ có thể xảy ra trong một hai thập kỷ tới. (The Paradox of Xi Jinping: Dr Jerkyll & Mr Hide? Nguyễn Quang Dy, May 17, 2017). Nhưng Zakaria cho rằng cần làm rõ ba điểm. Thứ nhất về Mao, hiện nay chủ nghĩa Mao chẳng còn nhiều ảnh hưởng. Thứ hai về chính trị, quyền lực của Tập chưa hẳn “độc tôn” vì cơ cấu nhân sự mới không hẳn như vậy. Trong thường vụ BCT, Lý Khắc Cường vẫn là thủ tướng, Uông Dương và Hàn Chính vẫn là người của phái Hồ Cẩm Đào và phái Giang Trạch Dân. Trong khi đó Trần Mẫn Nhĩ là một đồng minh thân cận của Tập (mà một số chuyên gia cho rằng có thể kế thừa Tập) vẫn chưa lọt được vào Thường vụ Bộ Chính Trị (như đồn đoán). Vương Kỳ Sơn là cánh tay phải của Tập, nhưng không còn trong Bộ Chính Trị (như đồn đoán) và ra khỏi cả danh sách Trung Ương. Phải chăng đây là dấu hiệu Tập đang dọn đường để ở lại thêm một khóa nữa, hay là Tập vẫn chưa hẳn độc tôn? Thứ ba là về triển vọng, vẫn chưa rõ Tập sẽ làm gì với quyền lực mới lớn hơn (tuy chưa hẳn tuyệt đối). Nếu Trung Quốc gặp may, Tập Cận Bình sẽ trở thành một nhà “độc tài được khai sáng” (enlightened absolutist) như Lý Quang Diệu. Nếu không may, Tập sẽ trở thành một hoàng đế chuyên quyền (như Mao 2.0). (Xi whizz: look at the emperor’s new clothes, Niall Ferguson, Sunday Times, October 29, 2017). Tuy “chủ nghĩa tân chuyên chế” (neo-authoritarianism) là chủ thuyết được vận dụng thành công từ thập niên 1990 (sau Thiên An Môn), đã được các học giả Mỹ (như Andrew Nathan và David Shambaugh) đánh giá cao là mô hình “chuyên chế có sức sống” (authoritarian resilience), nhưng nay đã hết màu nhiệm, đang biến thể thành “chủ nghĩa tân toàn trị” (neo-totalitarianism) và “chủ nghĩa tân bảo thủ” (neo-conservatism). Vương Hộ Ninh có quyền tự hào về học thuyết mà mình đã từng đề xướng, cũng như vai trò mới trong Thường vụ Bộ Chính Trị dưới triều đại mới của Tập Cận Bình (2.0). Nhưng Vương có thể chứng kiến biến thể của học thuyết đó đang xô đẩy Trung Quốc đến “Màn chót” (Endgame) của trò chơi quyền lực, như David Shambaugh dự báo hay “Hoàng hôn” (Twilight) của chế độ, như Mixin Pei mô tả. Trong giai đoạn cải cách lần đầu (1.0) Trung Quốc có thể vận dụng kinh nghiệm phát triển theo mô hình thành công của Đài Loan, Singapore, Hong Kong, Hàn Quốc… Nhưng trong giai đoan cải cách lần hai (2.0) thì phép mầu đó không còn hiệu nghiệm. Bài diễn văn dài ba tiếng rưỡi của Tập Cận Bình (như một luận văn tiến sỹ) ẩn chứa nhiều mâu thuẫn và nghịch lý cơ bản. Trung Quốc không thể trở thành siêu cường nếu không chịu cải tổ hệ thống chính trị. Nhưng nếu Tập cải tổ toàn diện chế độ như quy luật phát triển đòi hỏi, thì bóng ma Thiên An Môn và Pháp Luân Công có thể xô đẩy Đảng và chế độ cùng sụp đổ. Tập Cận Bình và Trung Quốc đang mạnh lên, muốn ganh đua với Mỹ, không phải vì bản thân Trung Quốc do cải tổ mạnh lên, mà vì bản thân Mỹ và phương Tây do khủng hoảng thể chế nên yếu đi. Tập Cận Bình muốn tập trung quyền lực tuyệt đối bằng mọi giá để giữ nguyên trạng (trong nước), trong khi lấn chiếm, bắt nạt các láng giềng, và thách thức vai trò của Mỹ để thay đổi nguyên trạng (tại Biển Đông). Dù dựa vào “Đường Chín đoạn” hay “Tứ Sa” thì tham vọng của Bắc Kinh không hề thay đổi. Sau Đại hội 19, tham vọng bá quyền của họ ngày càng lớn và càng rõ, như nỗi ám ảnh (hay ác mộng) đối với Việt Nam và ASEAN, làm cả thế giới đau đầu. Trong khi đó, giai thoại về “Xi Dada” đang biến thể thành “Xi Whizz”, làm người ta nhớ đến tác phẩm kinh điển về đa nhân cách là “Dr Jekyll & Mr Hide” (Robert Louis Stevenson, 1886). Trong khi hoàng đế trầm lặng Tập Cận Bình đang vươn lên ngang tầm với bạo chúa Mao Trạch Đông thì Trung Quốc ngày càng bá đạo và càng giống Frankenstein. 1. The Biggest Vote, William Safire, New York Times, May 18, 2000. 3. Xi Jinping Has Quietly Chosen His Own Successor, Andrei Lungu, Foreign Policy, October 20, 2017. 7. Why China’s Xi might come to regret all that power, Kerry Brown, South China Morning Post, October 29, 2017. 11. Trung quốc trỗi dậy và suy tàn: Giới hạn của quyền lực, Nguyễn Quang Dy, Vietstudies, 13/4/2016). In the first essay featured on this page by a contributing author, Hanoi-based analyst Nguyen Quang Dy assesses the status of reform politics in Vietnam. Comments are welcome. As always, the views expressed on this page do not necessarily reflect my own views. JL. The bold prediction by Peter Drucker twenty years ago might turn out to be true. The Internet and Internet of Things, together with new achievements in biochemistry and quantum physics, like the bullet train (generation 3.0), is changing the shape of the world. But Vietnam’s political management system still follows operating system 1.0. Indeed, the Vietnamese are still debating the pros and cons of the “Second Reform” (system 2.0). Traditional and unconventional thinking are like the Moon and the Sun, and their interface is like the solar or lunar eclipse when the blue Moon can be “eaten by the Bear”. Those who live for too long in the cave would shun the Sun. To free human beings from the cave of ignorance (as Plato said) is a difficult and dangerous process. To integrate with the world, they would have to come out of the cave, but their mindset could still be there. Let’s take one simple example. Vietnam sent agents to Berlin to abduct Trịnh Xuân Thanh, making Germany indignant over this blatant violation of sovereignty and international law (only seen in cold war action movies) While the Germans behave in the post-cold war era (operating system 2.0), the Vietnamese still behave as during the cold war (operating system 1.0). Vietnam wants to abduct Trinh Xuan Thanh and EVFTA as well? Given this context, the APEC Summit held in Da Năng in November 2017 faces many challenges and gaps. Vietnam continues to fight “peaceful evolution” and violate international law while it wants to welcome President Trump and US aircraft carrier? If the Vietnamese do not change their mindset and operating system, how could they integrate with the world and “make friends with all”? In the old days, American cowboys in the “Wild West” would be on horseback, chasing the steam engine trains (generation 1.0) at comparative speed. Now, if state managers think they can also use traditional horse carts to chase the bullet trains (generation 3.0) for control, it is ridiculous. If they demand the bullet trains to slow down like the Internet to behave “nicely as expected”, it is absurd. If they want to intercept the bullet trains at local stations for fines, it is an illusion as the bullet trains no longer stop at these stations. Since the “First Reform” (1.0), Vietnam has started to have market economy, but with “socialist orientation” and gradualism, therefore it is not yet true market economy, but a crippled and distorted market economy. It is a marriage of convenience between primitive capitalism (like wild predators eating each other) and crony socialism (like crocodiles without tears) thus giving birth to “red capitalist” monsters (like Frankenstein), as crony interest groups dressed up in socialist clothes but with a primitive capitalist heart inside. Japanese Prof Kenichi Ohno (from GRIPS Institute) once said that when he returned to Vietnam after five years, he found his Vietnamese friends still passionately debating the same issues as they did five years ago. If Kenichi Ohno returned to Vietnam 10 years later, he might find the same thing again. If Vietnam fails to change its institutional system and mindset (operating system 1.0), the economy would keep running around with its own economic model of “refusing to change” (as remarked by economist Pham Chi Lan). To escape this vicious circle the present government, which bills itself as a “constructive” government, should provide a breakthrough with comprehensive reforms. More than twenty years ago, the Vietnam Program at Harvard KSG conducted research and development of a book edited by Prof David Dapice (On the Dragon’s Trail, David Dapice, 1994), presenting an economic reform agenda for Vietnam. But when the book was published (after a few years) the situation in Vietnam changed considerably, making some discussion in the book irrelevant. To fill this gap, the Vietnam Program conducted another research project to produce a shorter document on reform (Choosing Success: The lessons of East and Southeast Asia and Vietnam’s Future, Harvard University Press, 2008). Another example is the report “Vietnam 2035: Toward Prosperity, Criativity, Equity, and Democracy, MPI & World Bank, February 2016). It is an important report recommending a comprehensive reform agenda for Vietnam, with extensive research and development efforts, taking a few years to complete. But by the time the report was published, the reality in Vietnam has changed a great deal. Therefore, without necessary update research, some parts of this important report might be irrelevant to new developments. No matter how good these reports are, if the state and corporate managers fail to change their mindset and institutional system in response to growing demands of life now changing with puzzling speed, it is like the story of the horse cart chasing the bullet train in vain. The gaps of thinking and operating system and the speed of change may turn the research and management systems into outdated and useless “relics” (Peter Drucker). Brexitism in the UK and Trumpism in the US have turned the world upside down, reflecting the demise of globalization and the rise of isolationism, nationalism and populism. The election of Donald Trump was the failure of the mainstream political elite and research community which failed to predict due changes. The power system of the Republican and Democratic Party failed to grasp new developments and respond to angry voters. In market economy, competition is the rule of development and elimination game. There is an interesting fable. Two hunters who went to the forest, were chased by a big bear, running for their life. After a long while, the first hunter was so tired that he said, “I cannot run faster than the bear”. The second hunter said, “I don’t have to run faster than the bear. I just need to run faster than you”. In competition, if you are not fast and strong enough, you may get killed by others. Some 200.000 companies (about 30% of the total) bankrupted as “clinical deaths”, perhaps for failing to understand market forces. Many companies survived by state’s bailouts, while only some survived by themselves. But, if they continue to rely on the state without inner strength, they may get killed again by international competition. While life is changing so fast, the research and management mindset and paradigm change so slowly. As the government starts talking about technological revolution 4.0 (though not really understanding it) some firms in Vietnam already start using robots in place of human workers. If corporate and trade union officials still stick to operating system 1.0, how can they deal with a new generation of workers of artificial intelligence (4.0)? Given a closer look, people might realize a sad fact of life that most Vietnamese would harbor extremism as a chronic disease. Extreme communists and anti-communists are very much alike, though they are enemies. As extremists, they would not listen to others for understanding or acceptance of different points of view (inclusive), but they try to reassert themselves and reject others (exclusive). As extremists, they are prejudiced and conservative, leading to confusion and wrong assumptions. This is a dangerous paradox and tragedy. For many reasons, moderates (and moderate views) are minority, easy to be ostracized and attacked by extremists (from both sides) for being different from them. Moderate supporters of liberal democracy are often accused by extreme communists as “peaceful evolutionary” and “reactionary” while being accused by extreme anti-communists as “communist agents” or “double agents”. In their mind, the extremists would not accept diversity and reconciliation. This is the legacy of violent class struggle and long civil wars. This incurable disease might have spread as metastasis to other parts of life including research and management. It should be clarified that research is different from propaganda, independent research different from guided research, and professional journalism different from propaganda. Unfortunately, some people have wrong idea and assumption, using “propaganda activists” to attack researchers and academics. This is not only distorting facts and information (“talking past each other”) but also counter-productive (as “shooting one’s own foot”). Right now, continued propaganda on “peaceful evolution” (mindset 1.0) would unwittingly support the Chinese at the expense of our national interests and foreign policy objectives. In the final analysis, to change the mindset and institutional system for effective management, people should change their paradigm and ideological perspectives. They should decide whether they want extremism or moderation, conservatism or reform, hatred or reconciliation, violence or non-violence, traditional or unconventional values, authoritarianism or democracy… whether they want brainwashing education for obedient tools of the system or open-mind and liberal education for reform and reconstruction. Mr Phan Chu Trinh’s revolutionary philosophy (almost a century ago) advocating “people’s enlightenment, higher morale, and livelihood” (Khai dân trí – Chấn dân khí – Hậu dân sinh) still remains an unfulfilled vision, while the national train keeps moving slowly, going off-track, and falling behind. National power systems and world order have been in crisis. Not only the UK and the US, France and Canada, but also the rest of the world face unpredictable challenges. This is a global political and institutional crisis helping Donald Trump (a business dealer) to beat the Republican and Democratic parties, and helping Emmanuel Macron (an inexperienced politician) to beat the major parties of both the left and the right, to win power. The world has changed so much and so fast, but the mindset and institutional system have changed so slowly and so little. For a clearer vision, perhaps we should read carefully Moises Naim’s book (The end of Power, Moises Naim, Basic Books, 2013). However, there is little hope that Xi Jinping would soften his ambition in the South China Sea (following the 19th CCP Congress). Even though “the Quiet Emperor” has chosen his successor (Chen Miner), his long shadow is expected to loom large at least for another ten years without a rival (Xi Jinping Has Quietly Chosen His Own Successor, Andre Lungu, Foreign Policy, October 20, 2017). Xi and the “China Dream” is the obsession of not only neighbors but also the rest of the world. But his zenith of power may be the “End Game” in this “Game of Thrones”. After several months of inactivity, I am re-launching this page, albeit with a somewhat different format and purpose. Specifically, in addition to my stuff, I will be publishing original pieces by contributors. I believe this change will make the page both more lively and interesting. I intend to undertake similar changes on my Vietnamese language blog, Xin lỗi Ông. More to follow, but best regards for now.